IS THERE anyone who doesn't have to deal with issues associated with work-life balance? It could be as simple as having a doctor's appointment during the workday or having to stay at home to wait for someone to fix your leaking roof. There are numerous examples of employees trying to juggle work with all the other parts of their lives. Some of the factors that increase stress include working longer hours, having limited support from bosses or co-workers, facing increased ambiguity or uncertainty at work, or overall job dissatisfaction. In fact, some research has shown that the workplace has become the greatest single source of stress. Some researchers state that at least 25 per cent of employees experience high levels of work/family conflict. With technological advancements leading to our 24/7 workday, it seems that work bleeds into the rest of our lives quite often. It also seems that personal time also bleeds into our work lives. The usual workdays of 9am to 5pm from Mondays through Fridays are not conducive to getting your eyes checked or dental work done or going to your child's soccer game. Researchers report that both men and women experience guilt when their family lives intrude into their work lives (rather than the other way around). This can lead to negative moods, anxiety, depression and other behaviours that can impact job performance. In response, an increasing number of workers are demanding that employers do more to reduce the stress of work/non-work conflicts. Some companies offer wellness programmes with fitness trainers, yoga instructors and stretching classes. Others offer healthier food options, on-site counselling, longer vacations and flexible schedules. These can be beneficial in reducing stress and increasing employees' effectiveness. For example, flexible work arrangements have been shown to be a very powerful tool for reducing stress and increasing employees' job and life satisfaction, job engagement, job retention and health. Perhaps companies can also start to really evaluate how work is done, how much work is assigned to each person or how much work is done "after hours". If some organisations had a policy that work could not be done on Sundays or some other day or after a certain hour at night, then this could liberate employees who are stressed about having to answer e-mail messages at all hours of the night and every day. Employees need to feel a greater sense of control over their own schedules to help them manage their work-life conflicts. But most people feel that management has a responsibility to help employees achieve work-life balance. 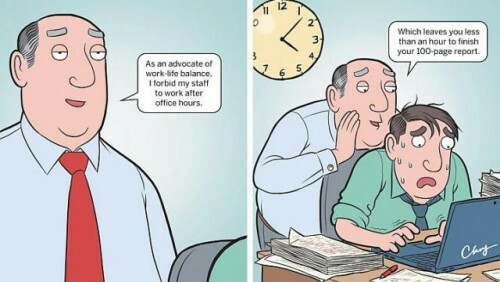 This means that employers will have to continue to find creative options to limit the amount of work/non-work spillover that occurs to reduce employees' stress and to ensure that work settings are set up so that employees can contribute fully while at the same time enjoy good physical and mental health. Employers who make an effort to help employees improve their work-life balance will have an edge in recruiting and retaining talent. In fact, research has shown that employees who are more favourable towards their firm's practices and initiatives to improve work-life balance are also much less likely to leave their company, and report higher job satisfaction and pride in their company. So, what can your company do today to help its employees achieve greater work-life balance? Every little bit counts.